From classes in pottery-making to live theater and jazz performances, the arts are coming alive at the Mallard Creek Rec Center and University City Regional Library. The Arts and Science Council will present more than two dozen free artistic programs through June. The Mallard Creek Recreation Center is at 2530 Johnston Oehler Road. University City Regional Library is at 301 East W.T. Harris Blvd. To see the full program itinerary, click here. 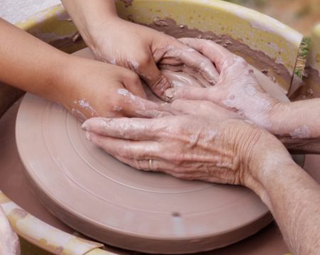 Join Clayworks for its Hands-on Clay workshop series, offered in at the Mallard Creek Rec center in monthly sessions for seniors, families and preschoolers. Learn to roll, pinch, texturize, slip and score clay while creating a different project at each workshop. Sessions start Thursday, Jan. 24, and run through June 27. Classes are free, but you must register by calling 980-314-1121. The Bechtler Museum of Modern Art will bring select pieces from its collection to University City Regional Library along with art-making workshops inspired by the artists’ work. Family Day for all ages, noon-4 pm Feb. 2. Culminating Event and Exhibition of Participant Artwork, noon-4 pm March 9. Art-making workshops for all ages, 2-3 pm April 25, May 2, May 9 and May 16. Experience a unique form of theater that depends solely on dialogue, music and sound effects (but nothing visual!) to tell its story. Cartage Theatre will present this radio-based art form at 10:45 am Feb. 7 at the Mallard Creek Rec Center. Stories are written by local authors and performed by local actors and musicians. Drapper Street Productions will bring live jazz, soul and blues performance to Mallard Creek Rec Center from 5 to 8 pm on Feb. 7, March 7, April 4 and May 2. Performances will pay tribute to both jazz greats and emerging jazz artists, featuring performances by local, seasoned talent. For ages 16 and up. Enjoy an afternoon with local jazz performers at the second annual Jazz on The Green, noon-5 pm May 11 at the Mallard Creek Rec Center. Bring lawn chairs and friends for this outdoor concert arranged by Drapper Street Productions.